Cosmetic or tooth bonding is a colored resin used to repair or strengthen a tooth by use of a special light. Unlike other forms of tooth repair, the cosmetic bonding method helps the tooth as it bonds with the other teeth and takes their natural. Cosmetic dental bonding can be used to perform different tasks on a tooth depending on the patient’s problem. Teeth may develop cavities due to you eating too many sugary foods or poor dental, oral hygiene. When a cavity develops, it can cause a lot of pain, especially when eating. Cosmetic bonding is used in these cases to fill cavities in teeth. Some people use their teeth to open soda bottles. This puts a lot of strain on your teeth. After some time, the tooth may crack or chip and fall off. Resin is used to restore a tooth that has chipped to its natural structure or cover a crack. Compounds in water and some food colors usually lead to teeth discoloration. When your front teeth are discolored, you may have a hard time smiling in front of people. 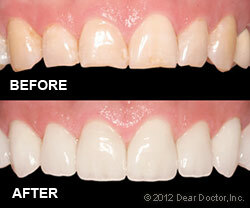 Cosmetic bonding helps clean off discolored teeth and restore them to their natural white color. Spaces in between teeth are usually not equal. Some teeth are close together while others are farther apart. This irregular spacing bothers many people and often leads them to seek medical attention. Dentists usually use cosmetic bonding to reduce these spaces as the resin used bonds completely with the teeth. Everyone has different perceptions of what constitutes beauty. Some people think if you have longer teeth, then your teeth look better. Thanks to cosmetic bonding, you can have your teeth made longer without the fear of them breaking. On the other hand, resin can be used to change the shape of the teeth to your specifications. Over time a part of the gum may recede, leaving a tooth root exposed. This exposed tooth root needs to be covered up to protect the tooth. Resin can be used to cover the exposed area and protect the root of the tooth from damage. Tooth bonding is an easy process of repairing teeth compared to processes like crowning which can take a lot of time to complete. Bonding can be done in a day’s visit, ensuring the patient does not continue suffering unnecessarily. Dental bonding typically does not require any anesthesia, however anesthesia is necessary when filling cavities because contact is made with the sensitive gum. Good tooth color, shape, and alignment are a few of the most important determining factors of having a beautiful smile. If your teeth are affected in any way by some of these issues, porcelain veneers could be exactly what you are looking for and needing. In dentistry, a veneer is a wafer-thin layer of very durable porcelain that substitutes natural tooth appearance and functionality. Veneers will create a natural-looking, beautiful new surface. Dental porcelain is similar to natural tooth enamel. It is translucent and strong, but a huge advantage is that it doesn’t stain like regular enamel! In today’s day and age, veneers can be made thin enough that they can be bonded directly onto your existing tooth surface. In other instances, a thin layer of tooth enamel needs to be removed first before fitting the new veneer and making it look as natural as can be. In either instance, the results will renew your smile and your confidence. Color — Teeth can be stained by the foods and drinks we ingest, from smoking, and even from normal aging. Veneers are available in a plethora of shades, from a very natural color to a bright Hollywood white. Size & Shape — Teeth can be worn down from bad teeth grinding habits, or may not have had the shape or size you wanted from the start. Veneers can be shaped and sized in whichever way is most fitting to your smile and face shape. Alignment & Spacing — Veneers can be used to close minor gaps between teeth and can make corrections in alignment while improving overall tooth color and shape. The first step in creating a new smile with is to communicate with the cosmetic dentist what you would like corrected with your smile as it is currently. It could also be helpful to have examples of smiles that you like to help convey where you would like to be after your procedure. It is possible to see how veneers would look on your teeth in multiple ways. We can create a model of your teeth in which wax “veneers” can be placed. Sometimes acrylic or tooth-colored filling material can be placed directly onto your teeth to help you see the potential effects veneers would have. Once a plan for your teeth has been agreed upon we will then prepare your teeth for the custom veneers. If applicable, we will remove a small amount of enamel to accommodate room for the veneers to fit properly. Molds of your teeth will then be taken and used by a dental laboratory to create your veneers. During the time it takes for your permanent veneers to be completed, we will provide you with temporary veneers. 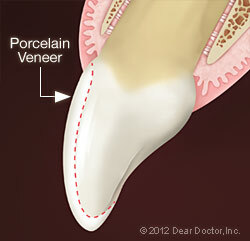 Once the veneers come back from the lab, they will be cemented onto your teeth and made to match your deisred color. Teeth that are restored with veneers need gentle brushing and flossing every day just like your natural teeth. Doing this will ensure that you have healthy gums around your new veneers. Regular checkups will remain just as vital as they were before. Keep in mind that even though your new veneers are extremely durable, they might not be able to withstand certain forces. You should avoid trying to open packages or eating foods that might damage your teeth! If you grind or clench your teeth at night, you might be advised to get a custom night mouth guard to protect your new veneers. Dental crowns are a great example of the modern art of cosmetic dentistry. A dental crown is also known as a “cap.” It is a covering that fits over a tooth that was repaired from damage, decay, or unattractive restoration. It can even replace a tooth entirely as part of dental bridgework. A crown completely covers up a tooth above the gum line. In contrast to dental veneers which only cover up a tooth’s front surface, the crown covers the area above the gum line. In this case if a tooth is missing a a lot of structure above the gums, a crown would be an advisable restoration procedure. Crowns are great at restoring tooth function and allow them to act like they normally would. Crowns are indistinguishable from natural and normal teeth since they are created from today’s high-tech dental ceramics. In certain cases, crowns can be used for restorative, cosmetic only purposes. Porcelain is no the only material crowns can be made from and it all depends on the desired goal and need for the patient. Cast gold is great for durability, since it is not prone to cracking in extreme cases. Even though this option is very durable, it might not be the best visual option, especially for front teeth. Another option could be a porcelain-fused-to-metal crowns (PFM). This crown is made with a metal interior that is used for strength and has a porcelain exterior to give the patient a natural tooth look. All-porcelain crowns that are created with zirconia are the strongest ceramic crowns offered. Our office will be happy to discuss the pros and cons of these options with you and which one would be the best fit for your smile. Crowning or capping a tooth can usually take around 2-3 visits. During your first appointment, the tooth is prepared to receive its crown. The first step will be shaping it to fit the cap. This will involve local numbing since there will be drilling to create a uniform shape for the tooth. In a case of there being little structure left for the tooth, the tooth will have to be built with filling material. After we have prepared the tooth an impression of the affected tooth (or teeth) will be made. This will be done either digitally or with a putty-like impression material. The mold will then be sent to the dental laboratory. The impressions will then be used to make models of your teeth to create the crown. These models will become guides to create a well fitting and very natural looking tooth that will fit your mouth perfectly. You will be given a temporary crown to make sure the area that received treatment stays protected until your permanent crown is made. On your next visit, the permanent crown will be placed to your tooth or the post that was made from the filling material and tested to make sure it is a perfect and comfortable fit. Once this is done the crown will be attached with a resin that hardens when exposed to a special light or with a permanent cement. Crowns can also be used to create a natural looking replacement for multiple missing teeth. This result is achieved through dental bridge work. It requires at least 3 crowns and spans across the area of the missing teeth. Two of the crowns are be placed over healthy teeth on either side of where the missing tooth is. The healthy teeth that are used as the “posts” are called the abutment teeth. The two teeth that are used as the abutments work as a support for the tooth that is missing. The third crown in the middle is referred to as a “pontic.” If more than one tooth is missing, more crowns will be needed to close the gap in between the teeth being used as abutments. The number of abutment teeth needed to replace missing teeth is directly influenced by the number of teeth that are missing, the size and length of the roots of the abutments, the amount of bone support each abutment has, and where the missing tooth is located. 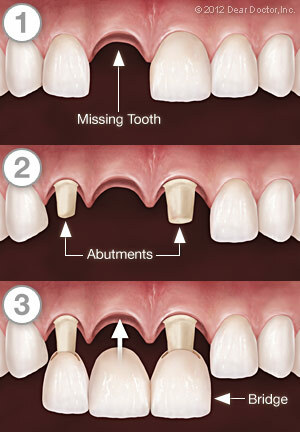 For example, if you have three missing teeth, you might need four abutment teeth. This would then create a seven-tooth bridge. Crowns and bridgework all call for the same amount of time and care as natural teeth. Brushing and flossing is vital, even on restored dental work, to keep plaque buildup off your teeth. Having dental crowns it is just as important, if not more so, to maintain your regular schedule of cleanings and dental hygiene at home as well as the dental office. Nutritional problems and other systemic health disorders can develop from not treating full or partial tooth loss. Fortunately for you, full or partial dentures are a reliable and time-tested method for treating tooth loss conditions. Dentures are just one of many cosmetic options for replacing missing teeth. Other procedures include fixed bridgework or dental implants. Each option has its positives and negatives, which should be heavily weighed when figuring out a plan with the dentist. There are multiple types of dentures available as well and each of them can address specific dental issues. A couple of these options include partial dentures or implant-supported overdentures. We can help you determine the best solution for you. Full or partial dentures consist of a gum-colored base that fits over the remaining alveolar (bone) ridge that formerly held the teeth. The prosthetic teeth used in the denture are made to look and act just like your natural teeth. Dentures are held in place primarily by the suction from their close fit against the alveolar ridges. This is why proper fitment is so important and absolutely necessary The upper denture also gets extra support from the surface area of the roof of your mouth.This generally makes the top denture extremely stable. Wearing dentures may be uncomfortable at first and will require some getting used to. Over time, though, the muscles, nerves, and ligaments of the mouth learn to work in new ways to support your new dentures. Functions like speaking, eating, and drinking will soon begin to occur normally. Dentures will also support the facial bones and the soft tissues of the lips and cheeks. This will help create a more youthful appearance and make sure you don’t have a sunken face. Immediate Dentures: These are usually a temporary solution to help you transition to permanent denture wearing. Since muscular readjustment is usually required, and the natural shrinkage of gums occurs, the dentures that are used right after tooth extraction won’t fit as well as the permanent dentures used when the healing is complete. However they do provide you with a new set of teeth right away and give you plenty of time to adjust. Conventional Full Dentures: Permanent dentures can be fit to your mouth with near perfect accuracy, to create a natural and comfortable mouth feel. These dentures are custom made to custom fit your mouth and last a very long time. Implant-Supported Overdentures: To increase the stability of a lower or upper denture, they can be secured by two or more dental implants. The upper jaw generally requires 3 or more implants and the lower jaw will usually require fewer. This is due to a lesser bone density in the upper part of the mouth. Many patients find that this option offers a balance of comfort, functionality, and value. Transitional Partial Dentures: These relatively inexpensive and removable plastic dentures serve as a temporary replacement and space maintainer as you wait for your mouth to heal from tooth extraction. Once healing has completed, your permanent solution can be implemented. Removable Partial Dentures (RPDs): These are usually made of cast vitallium. They are a metal-based removable partial denture that is much lighter and less obstructive than those made of plastic. They are generally a little more expensive than plastic dentures, but will fit better. They are, however, much less expensive than implants or fixed bridges. The first step is creating an accurate mold of the alveolar ridges on the top and bottom of your mouth. The base of the denture is fabricated from this mold in a dental laboratory. The dentist and lab technician will choose from many different shapes and sizes of prosthetic teeth to re-create a natural smile that is custom to you. To maintain a normal speech and proper eating surface it is absolutely crucial to balance your bite. This means that the dentures, both upper and lower come together uniform and create a proper stable feel. We will make sure that the function and form of your dentures is where you want it to be and ensure that you are happy with how they fit. If you’ve recently lost your teeth or had some removed and were provided with an immediate denture, you might notice some shrinkage or bone loss. This is completely normal, so don’t be startled if this occurs. After a while you may find that your immediate dentures might not fit as well as they once did. At this point you can have your immediate dentures re-lined. If we re-line, that means material is added under the denture’s base to conform to the new contours of your alveolar ridge for better comfort. Another option is to move to a set of conventional full dentures. These will typically last much longer and fit better. With the proper care, dentures can offer a fully functional, aesthetic, and economical solution if you have lost teeth or had teeth extracted. Scientific studies and clinical experience have shown that tooth-colored restorations and fillings are safe, reliable, and long-lasting. An added bonus is that they match your natural tooth color. 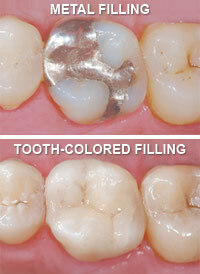 Tooth-colored fillings offer an alternative to “silver” amalgam fillings that are more visually pleasing. They can also allow for a more conservative treatment method that will preserve more of the tooth’s structural stability. These two positives alone are aiding in composite fillings becoming the norm in most dental offices. 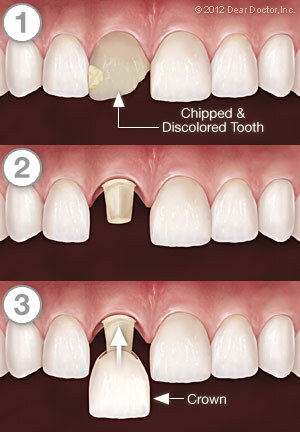 Tooth-colored fillings are made of “composite” plastic resins and silica fillers. These substances do a great job copying the many of the qualities of a tooth’s regular structure. Based on looks alone, you can see why a tooth-colored restoration in the front of your mouth makes sense. But, understanding some of the other advantages composite resins might offer we should look a closer at the overall restoration procedure. Decay, chips, or cracks can be major reasons why restoration and fillings are required. It doesn’t matter if you choose composite or amalgam, the procedure is practically the same. After the area has gotten local anesthesia/numbing, the tooth will then have the decay removed with a drill. Next, the filling material is placed where the decay was removed. After it has been bonded to the tooth and your biting surface is checked, the process is pretty much done. The minor difference between silver fillings and composite ones is that in order to have a good bond with a when using amalgam, the tooth will need to be shaped by making using “undercuts” that keep the material in place. Some healthy tooth material needs to be removed during this process. Over time this can lead to a lack of structural integrity and cause the tooth to crack. A great advantage of composite fillings is that they don’t require any undercutting and create an instant bond to your tooth. Going with a composite filling restoration can lead to a longer lasting filling and a healthier tooth. When are Tooth-Colored Fillings Used? Composite resins are appropriate for small to moderate-sized restorations which are the majority of most filling restorations. They are very durable, resistant to fractures/cracking, and able to hold up to chewing pressure. These procedures typically take just one visit to complete. If there is a larger part of decay that needs to be removed, an inlay or onlay may be required to have a successful restoration. Whatever the situation, the best way to determine whether tooth-colored, composite fillings are correct for your situation is to come in and have our dentist diagnose your situation. We can explain your options and help you out in finding the best treatment and restoration options that fit your teeth. We will help you in keeping a perfect and healthy smile. When your tooth has more extensive damage and needs restoration, you might not need a full dental crown. When this is the case, the best option might be an inlay or onlay to treat the issue. Both of these solutions are called indirect fillings. This means that they are created outside of the mouth and then bonded to the tooth by the dentist. Naturally, this is opposite to a direct filling, which is fabricated and cemented during your appointment. An inlay is usually placed within the cusps of your molars or premolars and an onlay typically covers more surface than an inlay. Although they cover different parts of the teeth, they procedure is pretty much the exact same. When you are getting either an inlay or onlay, you can expect a procedure that blends getting a filling and a dental crown. When you get a crown, your teeth needs to be reshaped significantly to fit the cap. Getting a filling is not as invasive and doesn’t require as much drilling or removal of tooth surface. Our goal is to keep as much of your natural tooth as healthy as possible to keep it as structurally sound as possible and going with an inlay or onlay will be able to give you both a strong restoration and tooth. The first step in this restorative procedure is administering a local anesthetic and removing any decay that is affecting the tooth. Removing decay is a vital part of the restoration procedure since it keeps the decay from spreading to other teeth. After the tooth has been prepared we will make an impression, either digitally or with a putty like material and sent to a laboratory. From there, a model of your teeth will be made to create an accurate inlay or onlay. The final material will be made from either gold, ceramic, or a composite resin. We will provide you with a temporary filling to make sure your tooth stays protected until your next appointment. 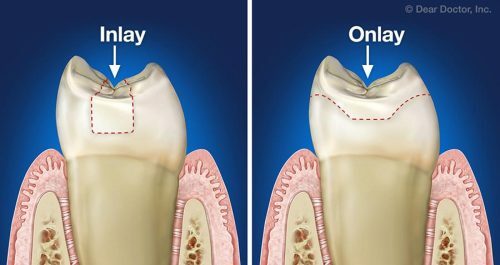 Once the permanent inlay or onlay is ready, it will be attached to your tooth either by a light sensitive resin, or a strong cement material. Inlays and onlays are strong and long lasting. They require no extra care than any other restorations or your other natural teeth. Make sure you maintain your home hygiene and regular dental visits to keep your teeth strong and healthy for many years. A restored smile can improve your confidence and how you feel in general. A smile makeover can restore and revitalize the way your teeth look. By combining restorative and cosmetic procedures the dentist will customize a smile makeover treatment plan that can repair cracks, chips, crooked teeth, help sculpt the gums, and make your teeth stronger and healthier overall. Every individual’s cosmetic goals are unique and different. A smile makeover can include teeth whitening, veneers, tooth-colored fillings,dental implants bonding, teeth straightening, contouring, laser gum sculpting, and much more. If you are looking for a smile makeover, the first step is having a consultation with the dentist to understand what your goals are and get a professional opinion for a treatment plan. Once the dentist assesses your mouth and smile, they will be able to help you figure out what procedures might be right for you. Once we create a custom plan for you, we will help you schedule appointments to make sure your smile makeover gets completed in a timely manner to have your confidence back in no time! After your smile makeover has been finished up, you will want to consult with the dentist to create and maintain a good home oral hygiene plan to make sure your restorations last a long time. Depending on the treatments performed during the smile makeover, the dentist may recommend special dental cleaning or maintenance products and might ask you schedule more frequent dental exams and cleanings to make sure your restorations are holding up. Proper dental care can make sure that your makeover lasts for years and years! "Excellent dentist and staff! They were so patient, kind and informative. I felt much better about what I was spending money on once they explained more about my teeth and what was or could happen. They kept me comfortable and stopped to reevaluate at the first sign of discomfort on my part. I would and will go back to get more work or check ups done."